With the Jewish New Year just around the corner I thought it wouldn’t seem right if I didn’t post a holiday cake. Since it’s tradition to dip apples in honey and eat a honey cake to symbolize the sweet new year ahead, and given that I don’t eat honey anymore, I was determined to create a cake that would still symbolize the sweet year. That’s when I came up with this vegan maple cake. It was when the cake came out of the oven that I knew I had succeeded! The vegan maple cake was fluffy, moist, perfectly spiced, easy to make, and everyone who tasted it said they wouldn’t have guessed in a lifetime that it was vegan! So whether you’re celebrating the Jewish New Year or not, I’m positive you’re all going to enjoy my latest creation! Heat a pan on medium heat, add the pecans, and toss until they’re lightly toasted. Transfer to a bowl until cool, then finely chop and set aside. Place all the wet ingredients in one bowl, and all the dry ingredients in another bowl. Separately whisk them both until combined, then when your oven is hot add the dry ingredients in with the wet and whisk until you have a smooth batter. Lightly grease your cake tin and place a third of the pecans in the tin. Next, add them to the batter, briefly mix, and pour all that goodness into the kugelhopf tin. 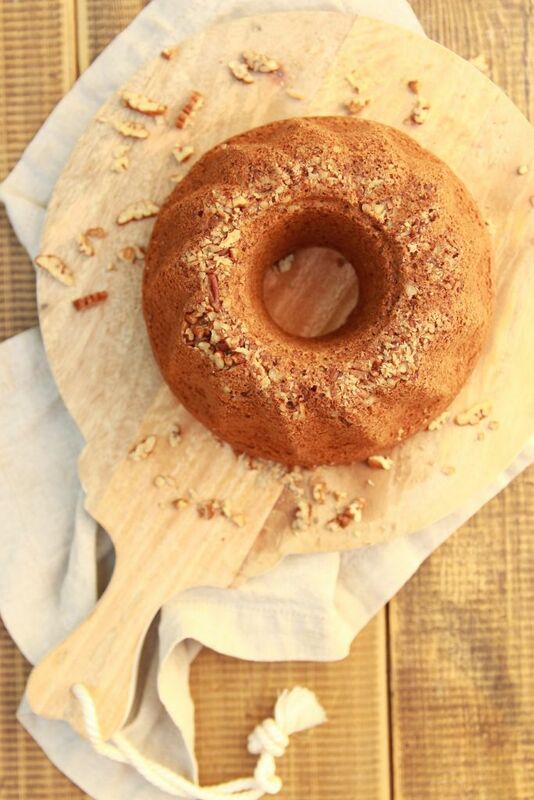 If you don’t have a kugelhopf tin, or prefer to turn it into a round cake, then lightly grease an 8 inch (20 cm) round cake tin, pour in the batter, and decorate the top with the remaining pecans. Pop your cake into the oven and bake for 20 – 30 minutes, or until a toothpick inserted in the center of your cake comes out clean. 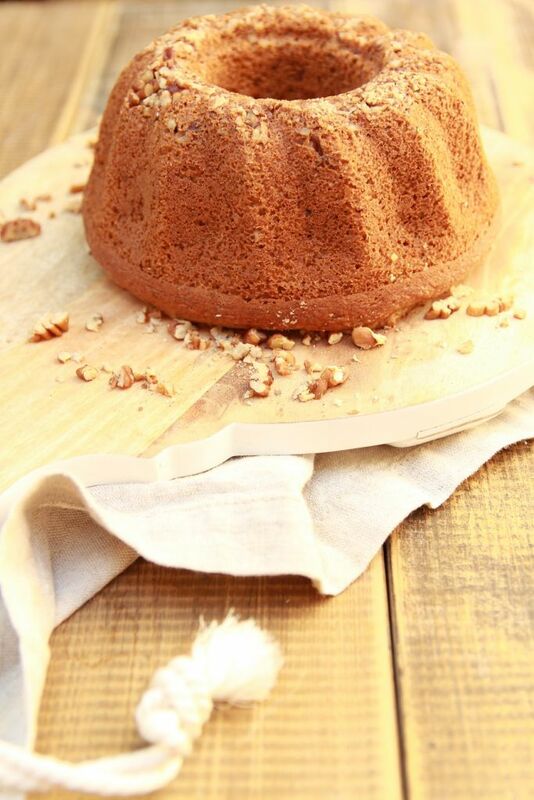 Remove the cake, and let it cool for 5 minutes, then flip your kugelhopf tin over onto a serving dish, and firmly bang the top several times, the more the merrier, to insure your cake will come out of the tin in one piece, then gently remove the tin, let it cool, and dig in! Be sure to tag me on Instagram @lets_brighten_up when you make this vegan maple cake. It honestly makes my day seeing your photos. 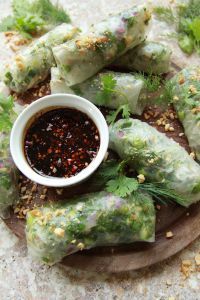 Next time be sure to try my super refreshing vegan summer rolls with a tamarind dipping sauce. SO insanely delicious. Or my heavenly baked vegan potato latkes. They taste even better than deep fried, and are healthier too! 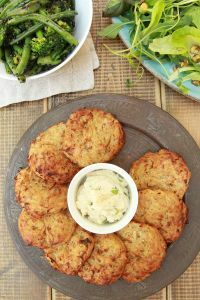 ← Baked Vegan Potato Cakes – Latkes! Beautiful Elinor!! I have been looking for a vegan tea cake recipe for a while!! This sounds so yummy, and perfect with a cup of tea! This looks wonderful! 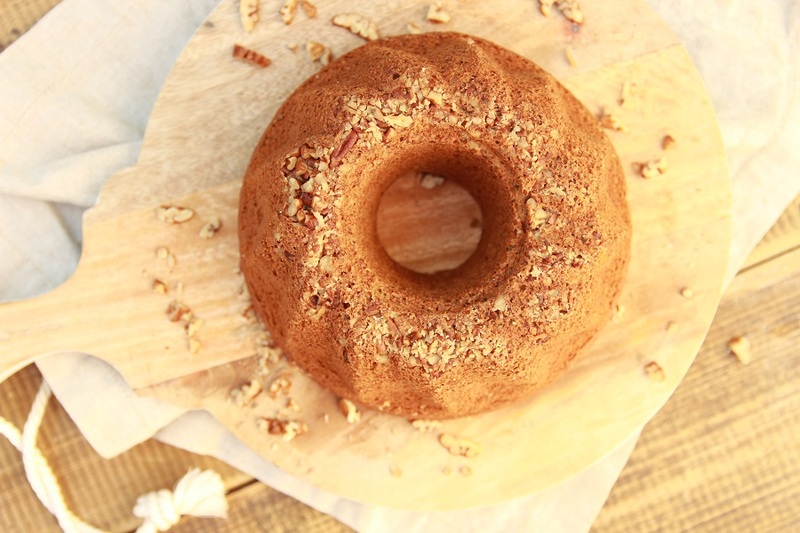 How would I adjust the recipe to work in a bundt pa? Double it? I’ve been wanting to try making an oil-free cake for a while and this one looks easy enough to start with and yummy too. Thanks! Is 320 degrees F (160 C) a typo? My cake took about 20 extra minutes to bake.